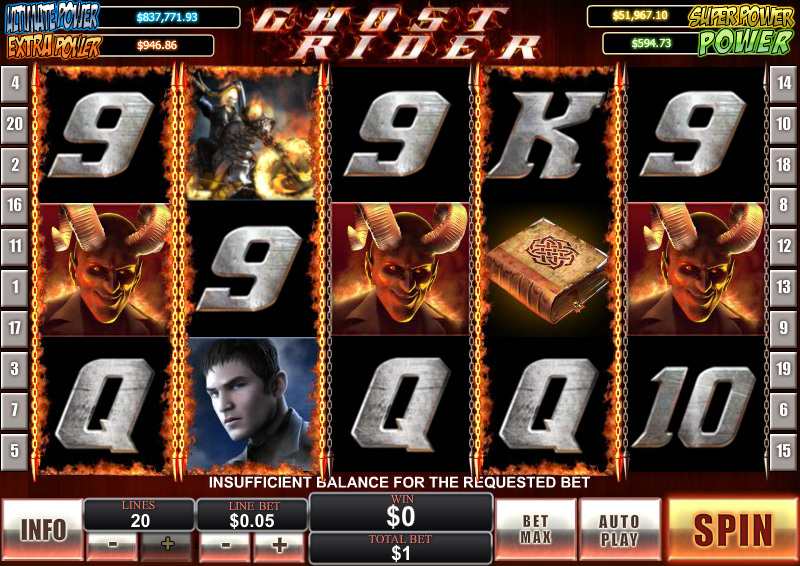 Ghost Rider is a new addition to the selection of Marvel Comic slots that are developed by Playtech. This new slot features 20 paylines, two bonus features, wild symbols that expand during free spins, and four progressive jackpots. As with most slots from Playtech, you will have the ability to adjust your bet by changing the bet per line and the number of paylines in play. The bet per line can be as low as one cent, and as high as $5, making the minimum bet $0.01 and max $100 per spin. The highlight of this slot game is the four random progressive jackpots that are offered. You will have the chance to win any of these regardless of the wager placed on the game, but if you place higher bets, your chances of winning will be increased. These progressives are linked to all other Playtech casinos, so the amounts can grow quickly. To help you generate more payouts, there is a wild symbol present on the three middle reels, which will substitute for all other symbols with the exception of the scatter. The scatter is the Ghost Rider logo which can appear in any position on any of the reels. When three or more land on the same spin, it will trigger a free spins feature, giving you 10 free spins with a x3 multiplier. During free spins the wild symbol will expand to cover the entire reel it lands on, and getting three or more scatters will award an extra 10 free spins. 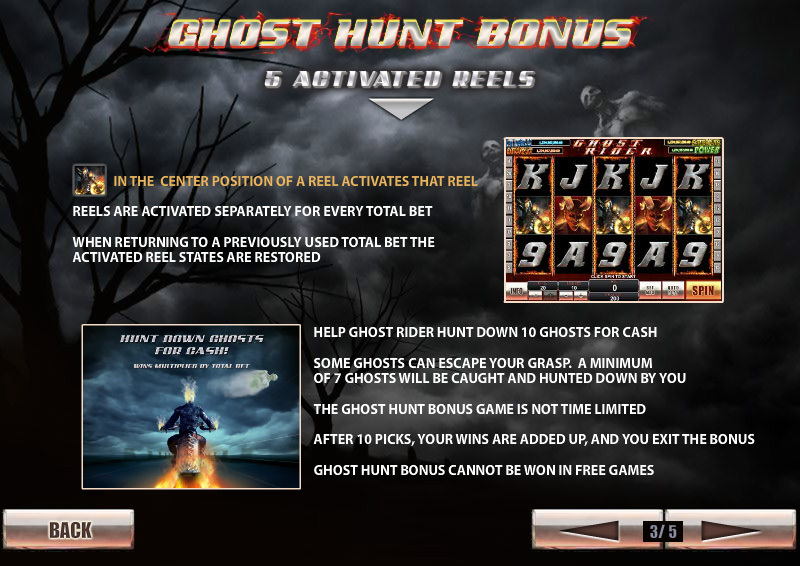 The Ghost Hunt Bonus is triggered when all 5 reels become activated. The symbol showing the Ghost Rider on a motorbike will activate a reel when it lands on the middle position of that reel. Any wins that are generated in the bonus round will be multiplied by the amount of the bet that was placed. 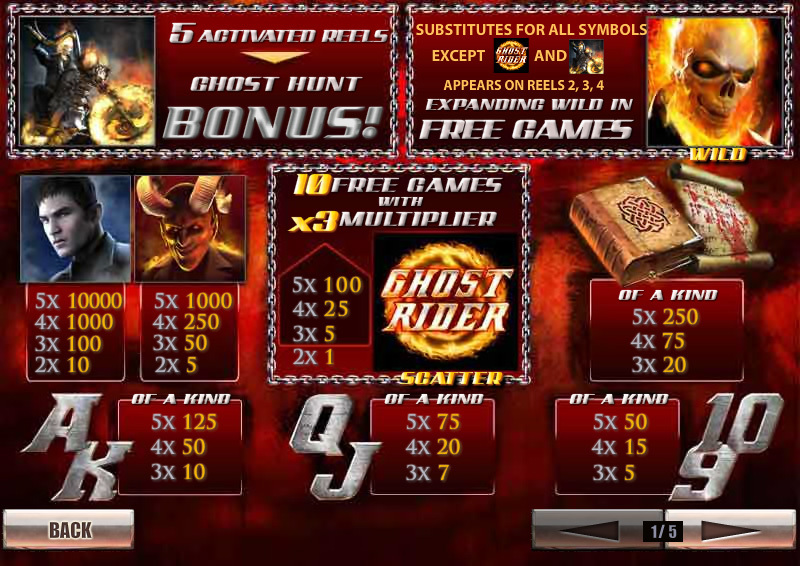 During the bonus, you will use your mouse to help Ghost Rider catch some ghosts and win some cash. Some ghosts can escape your grasp, but you will catch a minimum of 7 of the 10 ghosts that appear. Make sure not to change your bet when reels are activated, otherwise the activated reels of your previous bets will not apply. If you do change your bet and come back to the previous set total bet, the reels that were activated at that bet will still be activated. This feature can not be activated during free spins because the symbol that activates the reels is not present on the reels during the feature. You can play Ghost Rider now at any of these trusted Playtech Casinos.